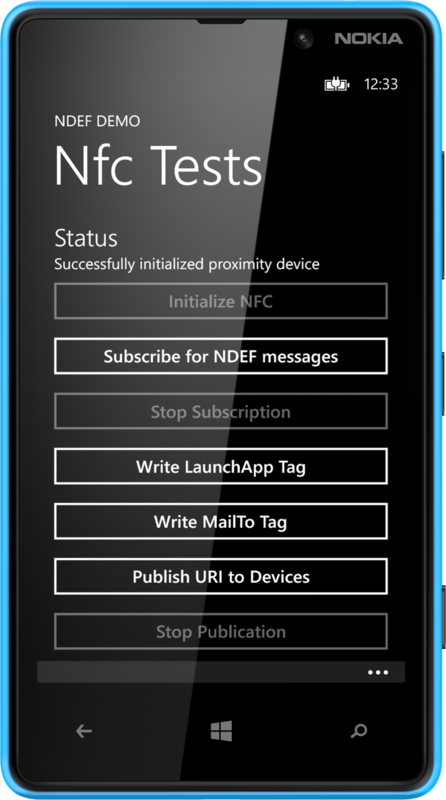 Easily parse and create NDEF records with the Windows Proximity APIs (NFC) for Windows 8 and Windows Phone 8. 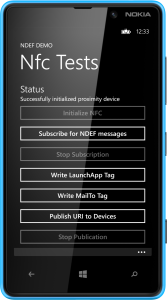 The Proximity APIs for NFC (Near Field Communication) in the Windows 8 platform are compatible to NDEF (NFC Data Exchange Format) messages, which are used on NFC tags and to send data between two devices. This NDEF Library provides a set of classes that enable you to easily work with NDEF records on top of the Windows Proximity APIs. Integrate the library into your Windows 8 platform project using the NuGet package manager of Visual Studio. The portable class library is fully compatible to Windows 8 & Windows Phone 8. URI: the most common type: any kind of URI, for example an Internet address, email link or any custom URI scheme. The library is released under the open source LGPL license, which allows using the apps for free both in open and commercial, closed source apps. The full source code and documentation is available on GitHub.